1948 Beechcraft Bonanza Model 35 Airplane Ad - Lunch! Vintage Paper Ads > Aviation - Airlines > Beechcraft > 1948 Beechcraft Bonanza Model 35 Airplane Ad - Lunch! This is a 1948 ad for a Beechcraft Bonanza Model 35 Airplane! The size of the ad is approximately 8.5x11.5inches. 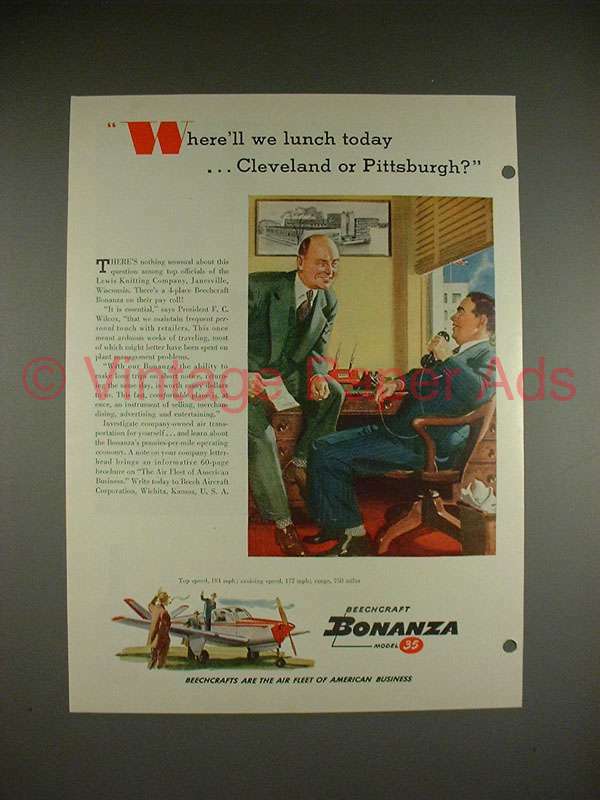 The caption for this ad is 'Where'll we lunch today.. Cleveland or Pittsburgh?' The ad is in good overall condition, with some light wear including some hole punches on the right edge. This vintage ad would look great framed and displayed! Add it to your collection today! 1964 Beechcraft Queen Air 80 Plane Ad - Earn Here!